Events have overtaken us recently with so many orders coming in, many of which are urgent, resulting in all our energies being channelled to ensure items leave us in time. Consequently, whilst the monthly draws have taken place we have not had time to update the website. Below are the winners from the past three draws. Their names were the first pulled from the metaphorical hat in each of our monthly feedback prize draws. 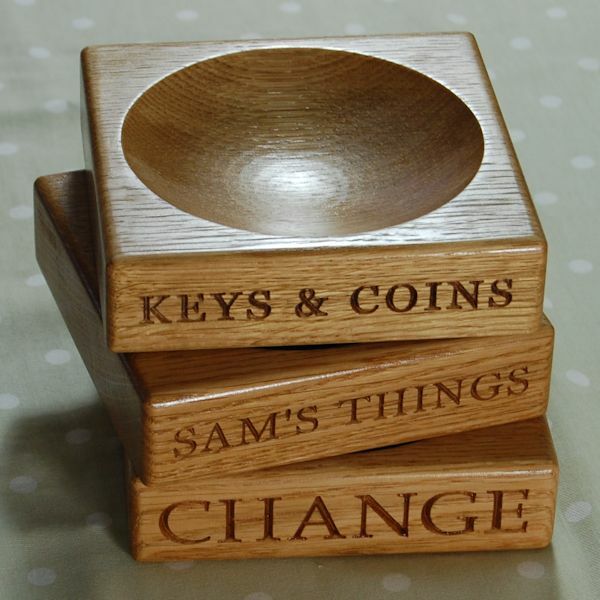 Each has received a beautiful personalised solid oak stash/keys bowl with a personalised inscription. Reviews and feedback on our website are anonymous. If you were not the winner and would like to purchase a keys bowl you can order from our Oak and Personal website. The prize for our next draw will be another keys/stash bowl, with the draw taking place on 15th May 2017. If you missed out this time, and have purchased from us recently please take a few minutes to email us your feedback – it costs nothing other than a minute or two of your time. Alternatively you can tweet using the hashtag #OakChopBoardCo or post to our Facebook page.